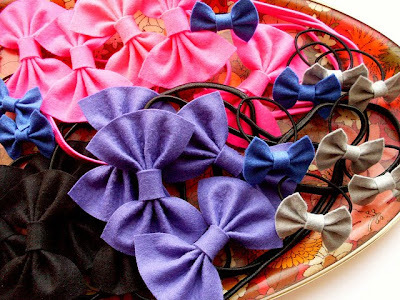 The big ones are headbands and the mini ones are super cute hair ties. I especially adore that bright neon pink... but my goodness it's a pig to photograph! If you fancy a bow of your own, the headbands are available in turquoise and yellow from my shops and there's one turquoise and one neon pink bow brooch left in the clearance section of my Etsy shop. you blog is soooo cute! !